FILE - Ethnic Chinese woman Meliana weeps during her sentencing hearing at a district court in Medan, North Sumatra, Indonesia, Aug. 21, 2018. Indonesia’s Supreme Court this week rejected the appeal by an ethnic-Chinese Indonesian woman who was sentenced to 18 months in prison last August for violating the country’s blasphemy law, a decision international rights groups called a troubling precedent. Deemed by rights groups, such as Human Rights Watch and Amnesty International, as a troublesome legal precedent, Meliana’s case started in 2016, when her complaint made its way around the fishing town. As it spread through neighborhoods and on social media, perceptions became all the more distorted — with many people saying that she had committed blasphemy. A mob rioted in front of her house — where she lived with her husband and four children — shouting obscenities, throwing bottles and rocks at her house, and setting fire to some of the town’s Buddhist temples. Ranto Sibarani, Meliana’s lawyer, told VOA that he and his client will file another appeal. “Yesterday we discussed the plan at the Tanjung Gusta [penitentiary for women in Medan, North Sumatra],” he said. Last year, he claimed that Meliana’s conviction, due to questionable legal proceedings, was predicated on hearsay and intimidation. Ranto said the counsel team maintains that its client’s conviction is an error. “We still believe that [the reason for her conviction was predicated on hoax]. Both the investigators and the police admitted to the media that they have identified many sources of false information regarding Meliana, but none of them have been tried,” he said. 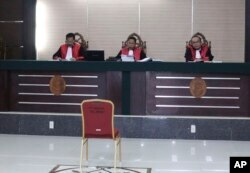 FILE - Indonesian judge Daliun Sailan, center, reads the court's decision to uphold an 18-month prison sentence for ethnic Chinese woman Meliana convicted of blasphemy, at High Court in Medan, North Sumatra, Oct. 25, 2018. Indonesia’s blasphemy law was signed in 1965 by Indonesia’s first president, Sukarno, as a way to appease a request made by religious groups to suppress the growth of indigenous beliefs. Twenty-three people, including Meliana, have been sentenced under that law since the country's current president, Joko Widodo, who’s running for a second-term in office this year, took office in 2014, Human Rights Watch said in October. The law, carrying a maximum five-year prison sentence, “punishes deviations from the central tenets of Indonesia’s six officially recognized religions – Islam, Protestantism, Catholicism, Hinduism, Buddhism and Confucianism ..,” according to Andreas Harsono, a researcher with the Human Rights Watch. Harsono told VOA the case was emblematic of discrimination against minorities in the country. “The victims are mostly those who are critical, particularly those who are critical and believe in non-Sunni religions,” Andreas said. “The law has elastic clauses: There’s no standard measurements; it's easy to be deployed for political purposes,” Andreas said. As Indonesia's presidential and legislative Indonesian elections approach next week, observers will closely watch how the blasphemy law will be carried out by each candidate. Joko Widodo will square off against the former military commander Prabowo Subianto. “The blasphemy law is the hardest to revoke among the other unjust laws,” Andreas said.